From the New York Times and USA Today best-selling duo behind The Unhoneymooners and the “delectable, moving” (Entertainment Weekly) My Favorite Half-Night Stand comes a poignant romance that follows two people who fall in love during a life-changing overseas vacation - only for the truth to change everything once they return home. As an adventurous send-off to her childhood, 18-year-old Tate Jones travels with her grandmother from their small town in Northern California to London. But the vacation of a lifetime is wonderfully derailed by the appearance of two charming Vermont farmers: grandfather Luther and his handsome grandson, Sam. Sam and Tate fall hard and fast. For two glorious weeks, the couple share their hopes, dreams, and secrets. Sam admits he suspects his grandfather is dying and that this could be the last trip they take together, and Tate reveals that she is the hidden daughter of one of the biggest film stars in the world - a secret she’s never told anyone before. But when Tate is exposed by a crush of cameras and reporters, she knows she's been betrayed by the one person she thought she could trust. She is forced to decide whether she will return to her quiet life or embrace being in the public eye. So when Sam reappears in her world more than a decade later, can Tate forgive the past and rekindle the passion they shared on their magical trip abroad? And does she even want to? 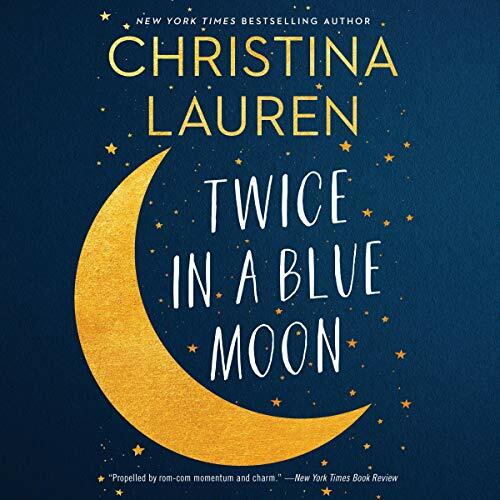 With Christina Lauren’s signature “beautifully written and remarkably compelling” (Sarah J. Maas, New York Times best-selling author) prose, Twice in a Blue Moon is an unforgettable and moving novel of young love and second chances.